Image above: Refugees look at wreckage after an attack during the mayhem in Partition, 1947. 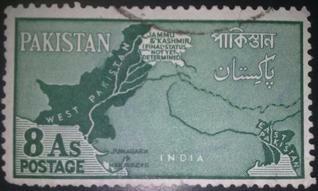 Below, first from bottom: rare stamp from the pre-partition period. A 78-year-old Sikh pilgrim from India celebrated the best Vaisakhi festival of his life when he stumbled into his long lost brother while visiting the Sikh Gurdwara, Punja Sahib, in Hasanabdal - near Taxila and Rawalpindi/ Islamabad - in Pakistan. It was an emotional reunion this week between Sardar Kartar Singh and Chaudhry Sultan Mehmood after the partition of the subcontinent separated them 63 years ago. So many things had changed in the intervening decades, including the religion of the brother left behind in newborn Pakistan, but not the blood that ran in their bodies. At the time of partition, a Sikh family settled in Islam Mughal, a village in Tehsil Pattoki, were forced to flee to newly carved out India but a son got left behind in the terror. Later, the young man converted to Islam and was given the name Chaudhry Sultan Mehmood. His four elder brothers settled in Pind Jhogi, a village in Tehsil Jeera of Ferozepur District in East Punjab. At the time of partition, Sardar Kartar Singh was the father of one child, but now he has eight children and over two dozen grandsons and granddaughters, while Sultan is also a senior citizen and father of many children. Kartar Singh's wife, Pirbinder Kaur, said she was happy to see the family reunion. She urged the Pakistani government to allow Sikh pilgrims to visit their native towns where they used to live before partition. She said a large number of Sikhs fled from various areas which now form part of Pakistan after the partition in 1947, including Sialkot, Lahore, Kasur and Nankana Sahib, to East Punjab in India but were never allowed to visit their native villages and ancestral houses where they lived before partition. 1: Surinder (Massachusetts, U.S.A.), April 21, 2010, 9:08 AM. There are many such cases ... the person left behind was always coerced to convert to Islam. Pakistan made sure after Partition that Sikhs were never really allowed to even visit their former homes. This is uncivilized behaviour, plain and simple. 2: Indy Gill (New York, U.S.A.), April 28, 2010, 9:19 AM. The irony is that in future the converted Sikh boy's generations (adherents of Islamic faith) will most probably create similar circumstances of fear, death and havoc inspired by their Islamic faith and teachings, for Sikhs. And one day, who knows, people may once again have to go through the same ordeals and forced conversions, but not at the hands of outsiders but by their own who themselves were simply forced into Islam. Sadly, this vicious cycle has not stopped for over a thousand years and, the way things are, there seems to be no end in sight either! 3: Mahendra (Framingham, MA, U.S.A.), June 23, 2010, 1:31 PM. Why does it always happen that those left behind in Pakistan seem to have converted? Is the same true in the reverse? 4: Surender Pruthi (Sonipat, India), October 18, 2011, 4:23 AM. Great reunion. No one can differ from the opinion expressed by the lady, the spouse of one of the brothers. It is high time that both the governments start considering the issue of allowing more of such families to get together. Nostalgia of the great old days is natural and should be taken seriously by the authorities. 5: Jamil Mirza (Lahore, Punjab, Pakistan. ), August 28, 2012, 7:51 AM. I agree with Mahendra ji. 6: Tamerlang Gill (Pakistan), January 14, 2014, 9:17 AM. Actually, I'm a Pakistani Christian from a Sikh background. Some of the Sikhs trapped behind the border after the Partition of Punjab converted to Christianity. Thus many Christians here now have Sikh last names like me and "Mann Singh Bahadar", etc. and usually have the images of their Sikh grandparents at home. 7: Sohail Hussain (United Kingdom), May 08, 2014, 12:12 PM. I'm a Punjabi Muslim. Well, that's what I like to refer to myself as. I'm from Faisalabad which used to be Lyallpur, Punjab. This is one of the many outcomes of Punjab being divided into two. Reading this was truly an emotional experience. Punjab should never have been divided, but instead made into a country of its own. Religion has ruined our beloved homeland, I don't care about India nor Pakistan, for me it's all about Punjab. Sikh, Muslim or Hindu, we are all brothers and sisters and the children of Punjab. The government of both countries should allow people easy entry into both parts of Punjab for them to be able to learn and experience the full story of Punjab. It hurts me to see what Punjab has been turned into. Punjab is the Golden Bird which had its wings cut off, then divided into two. We need to reunite the Punjabi people under one rule, neither a religious state nor a dictatorship but instead as a Nation of Punjabis. Inshallah, one day this will happen ... God willing. Sat Sri Akal / As-salamu alaykum! 8: Jagmohan Singh (Delhi, India), October 07, 2014, 9:48 AM. 9: Gian Singh (Nanaimo, British Columbia, Canada), October 26, 2014, 3:46 PM. I quite agree with Sohail Hussain: in this context, we are Punjabi first, everything else comes after. There is another problem: even Indian Punjab has been divided into three by the Indian government, there is not much left of Punjab. Comment on "Brothers Reunited 63 years after Partition"